There are fewer makerspaces in academic libraries than in public ones, and I believe this is due in part to the challenge academic libraries face of having to justify making as important at the level of higher education. Although public libraries obviously care about education, as well, their missions on the whole are allowed to be a bit broader and more varied. Although I know that making matters, occasionally it’s a struggle to explain to someone how a specific tool or type of making fits in with an academic library’s goals. I’d like to share a few of the experiences I’ve been lucky enough to have over the past few weeks that really drove home why makerspaces can do so much at the university level. This past week, a student randomly dropped by my office asking to use the sewing machine. Since I’ve been working with an event-based pop-up makerspace model, this is unusual, but I didn’t want to turn him away. I ended up discovering that he was planning a trip with friends over the upcoming break, during which each person was going to bring a flag representing their nationality. As he had been born in one country, then lived in another, this student felt no single flag could represent him, and he wanted to sew both flags together to fully embody his identity. This student who had never done any sewing before was able to walk away having used a sewing machine, picked up new skills, and completed a project with deep personal meaning. 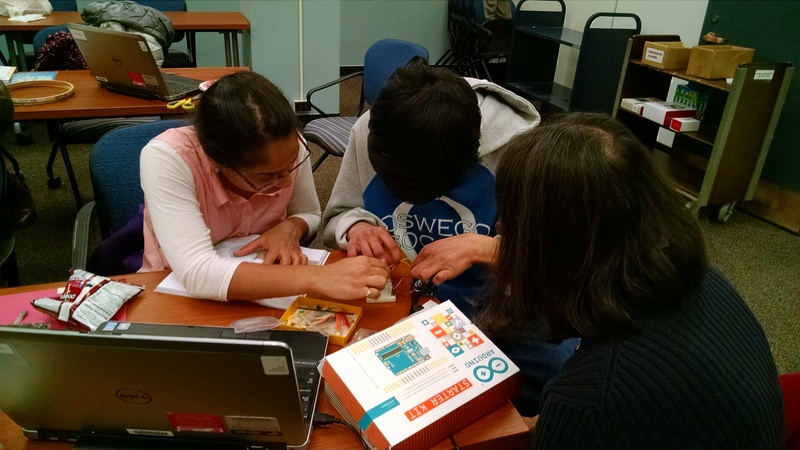 During the very first pop-up makerspace I held, a student completely unfamiliar with the maker movement immediately latched onto everything with great enthusiasm. Not only has she come to every subsequent event, she also has taken the lead on forming an official Maker Club and is considering buying a 3D printing pen of her own. The same student mentioned above has pointed out how much making is like art therapy. While this isn’t tied directly to scholarly pursuits, helping to bolster students’ mental health can be just as important. A faculty member attended one of the pop-up makerspace events and brought her son along. They worked together on an Arduino project. Cross-generational interactions and learning can take place in academic libraries, as well, not just public ones. These are just a few examples of the great things I’ve seen happening over the past semester. I would love to hear from others who have stories to share about how makerspaces can really make a difference in academic libraries. Tell your story below in the comments or share with us on Twitter!